Giulietta Spider 10103*171108. This car is on eBay right now out of Florida. 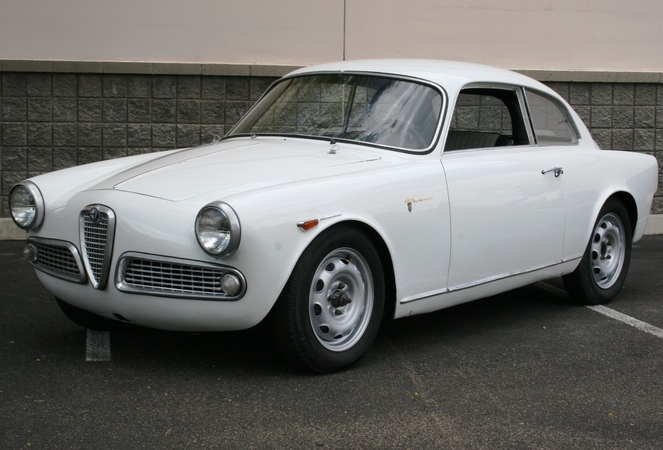 Car would originally have had an 00102 series 1300 engine but auction includes a 00121 1600 Sprint Speciale/Spider Veloce engine and an unnumbered 1600 replacement block. Price is $23,500 to start and seller expects local pick up only -good luck with that. Car looks pretty cool. Door and hood fit is excellent. I wonder what provenance this has as a racer. Giulietta Spider Veloce 10107*170380. 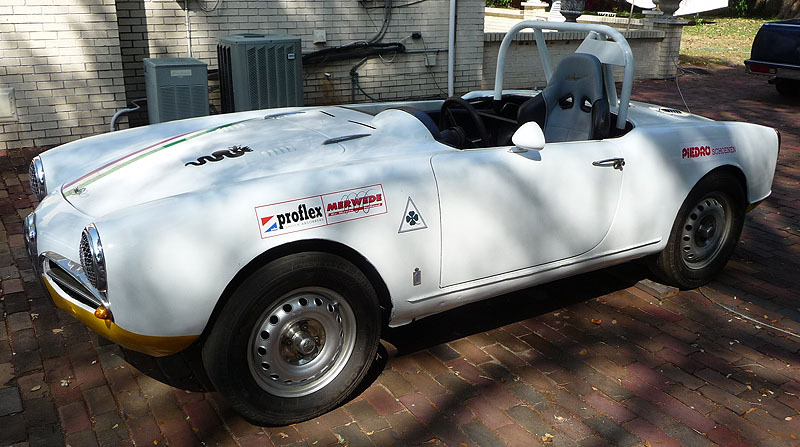 This car is on eBay right now and has been featured on Bringatrailer. Eduardo (seller) sent me a bunch of pictures you can see if you follow the vin link. Engine is a later 2 liter and a lot of modifications have been done that make it ineligible for most vintage race series, but with a few creature comforts added this would make a great event car. Email me of you can’t extract the sellers info from the above links. Looks like it should for a rally/race car. Hood is a later Giulia 1600 item, no doubt used to help clear the 2 liter. The silver lines seen through the grills are the edges of a big radiator. Update 1/8/11: This car is available again -this time it looks like it’s in Germany. The asking price is 41,900 Euro’s or a little over $54,000. The SS’s keep coming! 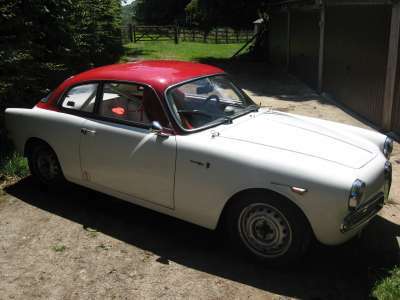 Originally posted 5/13/2008: Giulia Sprint Speciale 10121-380352. Available through Alfaholics for 39,000 Euros, about $60,000 at time of writing. Entire text of the advertisement reads: “Body # 380352. LHD. Body excellent. Engine tuned at 150 BHP. Roll bar. Racing tuned. 2008 FIA papers. Ready for season 2008. This car has done Tour Auto many times. Price: € 39 000. 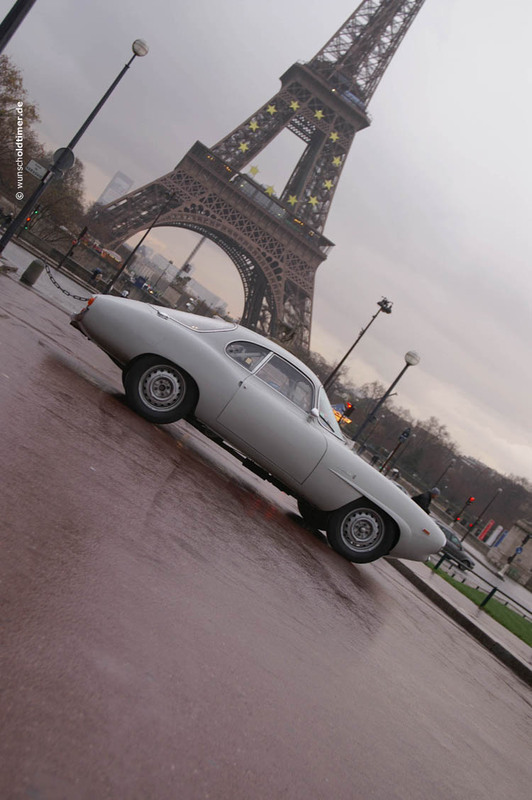 Car is in Paris.” I assume an inquiry would receive a in depth account of the car. Details of the car reveal a decent car was used as a starting point to make a pretty serious FIA racer. I like the lightweight plexiglass windows and lack of trim and if it was a track only car I could live with the interior, but for street use I’d like a little more of a period look on the inside. Always a nice profile. Wheels are later Sedan or GT items, the cheap way to put more tire under one of these without major body or suspension rework. 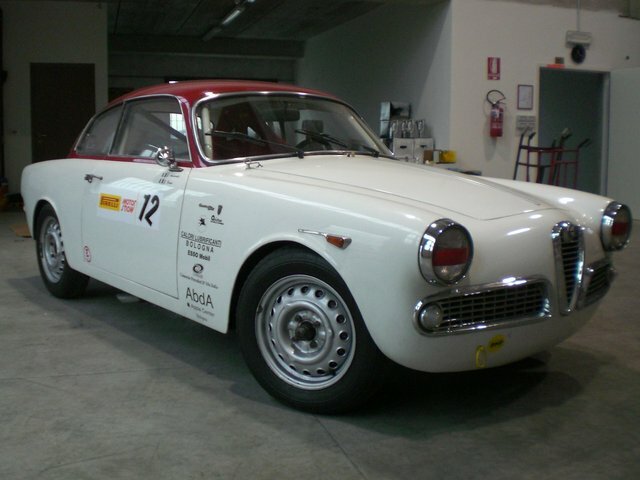 Marko sent me a link to this race prepped Giulietta SS, available on mobile.de, with a seller located in Italy. The asking price is 57,900 Euro’s or about $77,500. Seems like a lot, but there is no telling what was done to make it a race car. If anyone knows the VIN for this car, let me know. The airbrush job on the background is interesting. Wheels are later small-hole Borrani’s. 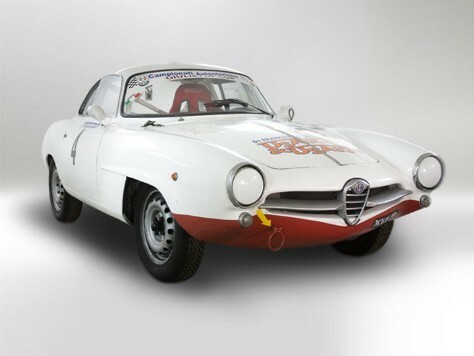 Giulietta Sprint Veloce 750E 1493*06930, 1315*31248. 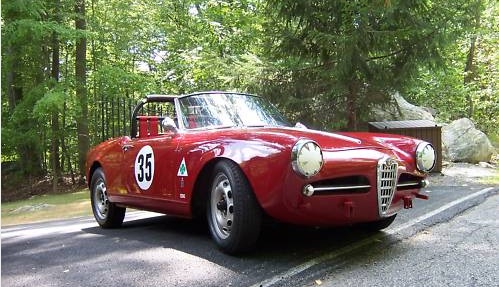 This car, on eBay right now, first hit the giuliettas dot com radar in December of 2008 with Market 72 -a racer that had a little mishap in the parking lot ending up with it running into a trailer. As it is presented now, the bodywork up front has been done and the car resprayed along with some light detailing. Asking price has been upped from $28,000 to $32,500. The car looks to have been lowered since the last time it appeared for sale. Repairs to the front look pretty good as does the paint -though it’s very hard to tell the quality of a white paint job from pictures. Update 10/26/10: This charmer has found its way to the UK and can now be had for the same money it was before. Most of the stickers have gone -two tone is still a little odd but works for a race prepped car. 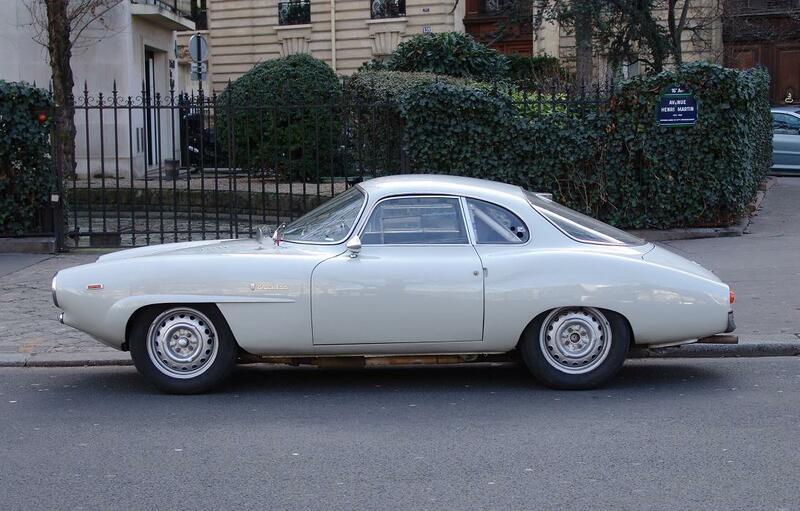 Original post 4/8/2009: Giulietta Sprint 10102*160784. This racy fellow is available now on Classic Driver for 21,950 pounds (about $32,000 at time of writing) from a private seller in Italy. If you are looking for a Sprint that’s not too dear to take racing this might be the right car for you. I’ve been thinking about going racing in my local vintage racing scene and this is the sort of car I would build. Paintwork looks great as does all the trim. I’d be tempted to remove some of the grills. I like the color combination. Update 7/26/10: 2 bids, $33,000 selling price. Not bad. 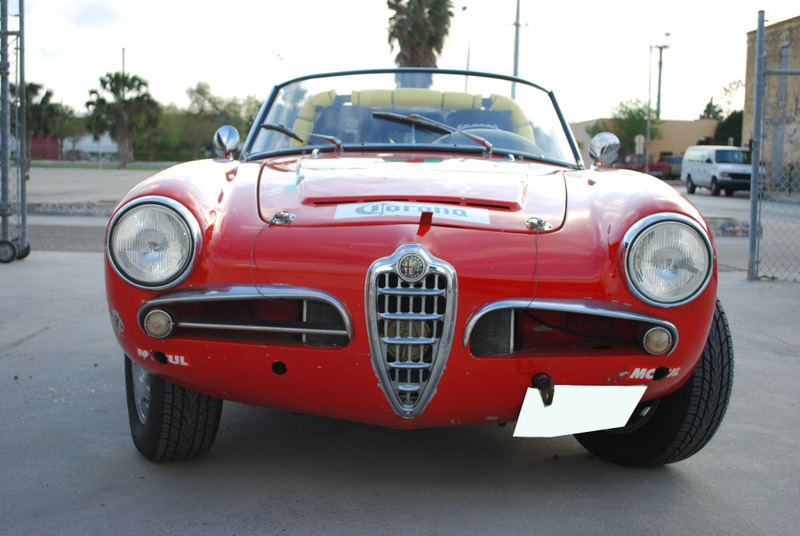 Giulietta Spider 10104 1495*09366. This Spider racer is for sale on eBay right now out of Putnam Valley, New York. Seller states it has a VSCCA log book, runs great and is ready for action. Price is a little higher than I would think but it is rust free and race engines are expensive to build well, so maybe the $35K option will be exercised. Red on green is always a good look. This car is very low. I like the grill bars only look.